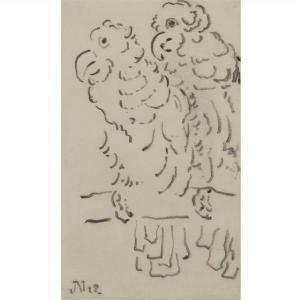 Find artworks, auction results, sale prices and pictures of Jacob Nieweg at auctions worldwide. 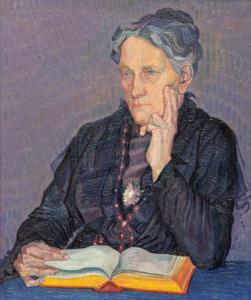 Jacob Nieweg (1877-1955) A portrait of the mother of the painter monogrammed and dated '1917' (lower right) oil on canvas, 59x49 cm Provenance: -Auction, De Zon, Amsterdam, 29 September 1976, lot 5510. -With Kunsthandel H. Jüngling, The Hague, 1977, where acquired by the family of the present owner. Volgrecht is van toepassing op dit lot. 50 x 61 cm. .
signed with the monogram and dated 28 l.l. Offered together with a pen drawing by Jan Zondag depicting A pony at pasture. 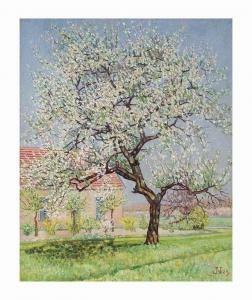 Jakob Nieweg (1877-1955) Blossoming tree signed with monogram and dated '29' (lower right) oil on canvas 55.5 x 45.5 cm. Painted in 1929. 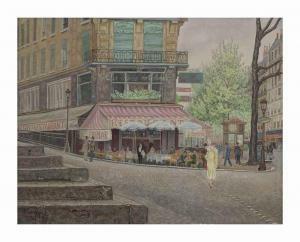 Jakob Nieweg (1877-1955) Cafe in Paris signed and dated 'J Nieweg 1934' (lower left) oil on canvas 35.5 x 45.5 cm. 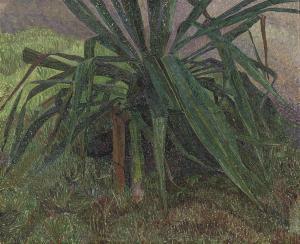 Painted in 1934.